I've always liked my hands. 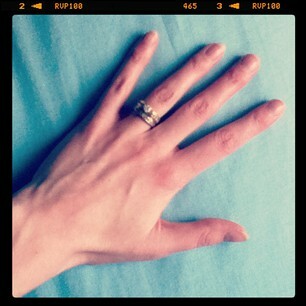 My fingers are long and thin- "piano hands", they'd say. My finger nails grow long, and I trim them so that they curve at the ends. They remind me of my mother's hands. They are mine, and I think they're nice. Lately, however, my hands have caused a lot of frustration, a lot of pain, and a lot of sadness. It's nothing I chose for them to do. It's just something that has happened to them. I don't know what's causing it- I just know that it's painful, and that the doctors can't confirm anything or make a diagnosis at this point. This is the second "flare up" that I've experienced. The first time Katrina was 6 months old and my saddest memory from that time is of having to pick her up, out of her crib by squeezing her between my arms, because my hands just couldn't do it. This time around, my saddest memory is of having to ask my husband to put my hair in a ponytail for me because I can't take the pain of doing it with my own hands. A couple of times, I've thought they were getting better. I'll have a few good days, and I'll get hopeful. Then I have a bad day, and it's hard not to worry about the future and about what this means for what I'll be capable of both in the near and the distant future. I'm sad about being unable to do things around the house, and I'm sad about how much pain it can cause just to hold my camera for a few shots, let alone a couple of hours, when I'm having a bad day. One thing that this experience is giving me is an appreciation for the times when my hands feel well- for how capable they are when they're working right. I just pray that whatever is wrong isn't permanent, won't continue to get worse, and will leave me again- for a long time. I'm so sorry about the mystery pain that you've been experiencing in your hands (which ARE beautiful by the way). It doesn't sound fun. Hopefully they will stop giving you grief or the doctors can figure out what's going on... Praying for you! Praying that this too shall pass!